Christmas 2010 and New Year Greetings! Savior and Redeemer of the world! – your salvation, as You have promised! See, He will come to save us! Happy holidays with wonderful memories to cherish! Have a joyful and blessed Christmas! that’s filled with peace, joy, love, good health and the best of everything! And God’s abundant blessings to you and your family always! Here’s also thanking all visitors and friends to our garden site and for your continuing visits, comments, support and encouragement through the years. All these are very much appreciated and please do pop in again! Jacqueline, thank you very much for your help, encouragement and all the lovely, informative posts written in the wonderful blogs of yours. I have enjoyed reading your posts and following your progress. 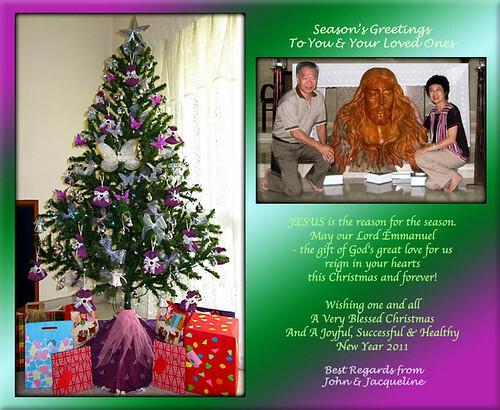 May you and John have a blessed Christmas and Happy New Year 2011 and May The Lord Bless you and your family always! You’re such a warm and sincere friend, A. Belle. Our hearts smile as we read your encouraging expressions and lovely wishes. Thank you so much! You and your family are wished the same too – A blessed Christmas and fantastic year ahead with God’s richest blessings always! Hello Jacqui, I hope everything is fine with your family. I read in your comment with Autumn Belle about your mom. I might not have been visiting here but i do remember you and your e-helps to some blog readers. Happy Holidays and wishing you a Blessed and Healthy New Year. God Bless. Thanks for enquiring, Andrea…we’re all fine, just that we have a ‘big baby’ (John’s lovable 87-year-old mom) to care for, now that she’s residing with us permanently. She’s probably having some degree of alzheimer. Compliments of the Season and a blessed, healthy and fulfilling 2011 to you and your family. God bless you too!